Does your neck feel stiff when you awaken in the morning? Do the muscles seize painfully with no warning? Does neck pain limit your physical activity and become your constant companion? If you suffer from pain in your neck, you have plenty of company. Doctors estimate that seven out of 10 people will be troubled by such pain at some point in their lives. One in 10 adults is hurting right now. And between 50% to 85% of people with such pain will be bothered by it again within the next five years. Clearly, neck pain is a common, and troubling problem. But solving the problem is no quick-fix. Managing and relieving neck pain can involve a combination of therapies including medication, physical therapy, self-help techniques, and, less commonly, surgery. More than ever, patients now play an increasingly important role in their own recovery through participation in stretching and strengthening exercises and mind-body therapies. Our special report Neck Pain: A troubleshooting guide to help you relieve your pain can help you manage your discomfort, increase your mobility and prevent future flare-ups. Don’t let neck pain limit your lifestyle. Neck pain isn’t all the same. There is no shortage of ways to describe it, in part because people have different perceptions of how they experience pain. The type of pain will also vary based on what is causing it. How would you describe your neck pain? Are your neck and shoulders stiff? Do they ache? Do you feel a sharp pain or hear a grinding noise when you turn your head? Pain can be mild or severe, achy or sharp, stationary or shooting. It may stand alone or be accompanied by other troublesome complaints. By clearly describing your specific neck symptom — or combination of symptoms, because they often overlap — you can help your doctor determine what’s wrong and how to help. The following descriptions will help you clearly explain your symptoms to your doctor. Muscle pain. 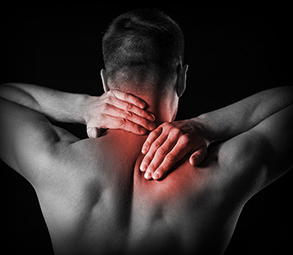 Aching or sore neck and shoulder muscles may occur in response to overexertion, prolonged physical stress (usually from poor neck positioning during everyday activities), or emotional tension. Muscles may also develop hard knots that are sore to the touch, sometimes called trigger points. Muscle spasm. This is a sudden, powerful contraction of neck muscles. When you wake up with a painful stiff neck, that’s likely a muscle spasm — what is sometimes called a “crick” in your neck. The muscle usually feels painful, tight, or knotted, and may be impossible to move. Muscle spasm can result from a muscle injury, but it may also occur if there is a deeper problem (say, in a disk or nerve) and the muscle tenses in order to stabilize the neck and prevent you from moving in a way to cause pain or further damage. Neck muscle spasms sometimes accompany emotional stress, but often there is no identifiable reason for muscle spasm. Headache. Neck-related headache, called cervicogenic headache or cervical headache, is most often felt in the back of the head and upper neck, where muscles extending along the skull are contiguous with neck muscles that may become tense or go into spasm. 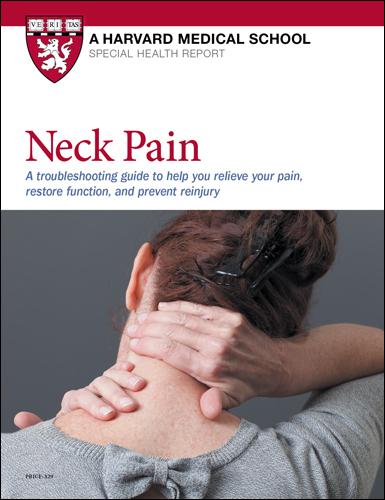 Neck-related headache pain is typically dull or aching, rather than sharp. It is aggravated by neck movement and often accompanied by stiffness and tenderness of neck muscles. Facet joint pain. Often described as deep, sharp, or aching, facet joint pain typically worsens if you lean your head toward the affected side, and may radiate to your shoulder or upper back. Arthritis in the facet joints, as in other locations, may feel worse in the morning or after a period of inactivity. Referred pain. When you feel pain at a site removed from the area where the problem lies, it is said to be “referred.” A variety of conditions may cause referred neck pain. For example, neck pain that worsens with exertion may indicate a heart problem, while pain when you eat may stem from a problem in the esophagus. You may feel pain in your neck from shoulder damage; conversely, what you feel as pain in your shoulder, head, arms, hands, or chest may actually be referred pain from your neck. Bone pain. Pain and tenderness in the cervical vertebrae are far less common than neck pain from the soft tissues. Bone pain needs medical evaluation because it can stem from serious conditions such as cancer or infection. Most neck pain doesn’t stem from anything medically serious, making it safe to try self-care strategies before seeking medical help. However, if your neck pain is so severe you can’t sit still, or if it is accompanied by any of the following symptoms, contact a medical professional right away. Fever, headache, and neck stiffness. This triad of symptoms might indicate bacterial meningitis, an infection of the spinal cord and brain covering that requires prompt treatment with antibiotics. Pain traveling down one arm, especially if the arm or hand is weak, numb, or tingling. Your symptoms might indicate that a herniated cervical disk is pressing on a nerve. Loss of bowel or bladder control. This might indicate pressure on the spinal cord or spinal nerve roots, needing immediate attention. Extreme instability. If you can suddenly flex or extend your neck much farther than usual, it might indicate a fracture or torn ligaments. This usually occurs only after significant impact or injury, and is more likely to be detected by your doctor or on an x-ray than by your own perception. Persistent swollen glands in the neck. Infection or tumor can result in swollen glands and neck pain. Chest pain or pressure. A heart attack or inflamed heart muscle can cause neck pain along with more classic heart symptoms.